The Profitable Performance Marketing: More Money for You panel from Affiliate Summit East 2009, which took place August 9-11, 2009 in New York, NY. Presenting actionable items for 7 main topics, including social media, negotiating, points of sale opportunities, content that pulls, partnerships, prioritization, and the expense of inefficiency. Note: the company(ies) and position(s) listed above were current as of the time of the conference. Some of this information may have changed since then. What Should We Do to Wrap Up Affiliate Summit East 2011? We had to juggle the agenda for Affiliate Summit East 2011, due to a keynote speaker being unable to make it, and now we’ve got some open time. The time slot from 3:30 to 4:30 on Tuesday, August 23, 2011 is open and we need your help to take this lemon and make some lemonade. What would you like to see for the closing session at Affiliate Summit? Got something better? We’re all ears. Share your feedback on the Affiliate Summit blog. Q: Shawn, I would first like to thank you for you willingness to share your experience and success, it’s much appreciated. You mentioned not to proceed with your Extra Money Answer blog if you’re looking to get rich, I get that, but I’m looking to reach the point where I can reduce myself to one job (short to medium term) and potentially see affiliate marketing as a full time business some day. Is that feasable? Or should I only expect to make an extra $50-$100 or so a month? I realize I have to put in the time and effort (your information is a great help). A: There are quite a few people who are making their livelihood through affiliate marketing. However, most people are not at that level, so I created Extra Money Answer to provide a realistic expectation of the potential for an affiliate marketer. Most affiliates are making $25, $50 or $100 a month… if they’re making anything at all. The possibility to support yourself with affiliate marketing as a career is out there, but don’t expect it to happen quick or easy. I would suggest the path I took where I worked for many years at a full-time job and did my affiliate stuff on the side. This was in addition to a number of other part-time jobs, including freelance Web design, managing some sites for companies, weekend editor of the sports section for NJ.com, etc. to supplement my income. Eventually, I was able to grow the affiliate marketing activity to be a job by itself. The Race to Affiliate Summit East 2011, a dailymile challenge where Affiliate Summit will donate $1 to the Avon Breast Cancer Crusade for each mile run or walked (up to $5,000) through the challenge, is running through 07/31/2011. There are currently 54 folks involved in the challenge, and the top ten runners have already tallied 1,755 miles. Overall, there have been 2,839 miles walked or run by all of the participants, so it’s $2,839 raised so far. I am at #4 right now (see my dailymile profile) with 190 miles – catch me if you can. Here are the top ten runners, as of July 27, 2011. In order to participate in dailymile activities, you will need to friend me on dailymile and I will invite you to the challenge. The challenge is going through 07/31/2011. Get more details at http://www.affiliatesummit.com/2011/05/23/race-to-affiliate-summit-east-2011/. The AffStat Special Report: Women in Affiliate Marketing 2011 is now available for free. The report can be viewed online or downloaded. Approximately 300 companies were surveyed regarding women’s involvement in their affiliate marketing businesses for this report. The AffStat Special Report: Women in Affiliate Marketing 2011 contains survey data and charts on the industry overall, as well as segmented data on affiliates, merchants, affiliate networks, cpa networks, technology providers, and more. Feel free to use material from the report in blog posts, presentations, etc. Just reference that the information came from the AffStat Special Report: Women in Affiliate Marketing 2011. Paul O’Brien of SEO’Brien.com spoke on “5 Things That Really Matter in SEO” at the Affiliate Summit Austin Meetup on July 26, 2011. Paul discussed things such as how URLs matter, content is king, and the importance of links. 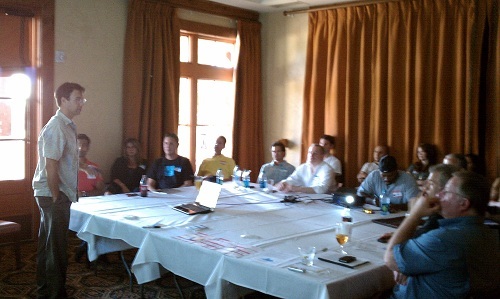 Plus, he did some live site reviews for folks in attendance. Paul runs marketing organizations for startups as SEO’Brien. Paul worked at Yahoo in the late nineties through 00s for about 5 years. Initially in Yahoo Shopping / Store, onboarding eCommerce companies, Paul shifted to advertising programs across the Yahoo properties after their acquisition of Overture. Left Yahoo to run online marketing for HP’s eCommerce business hpshopping.com. There, implemented HP’s search engine optimization program and rearchitected the shopping platform resulting in double digit organic growth of in a matter of months. More than SEO, Paul there ran a $15MM search marketing budget, affiliate program, email, etc. He joined local search engine Zvents.com to architect the optimization of their search platform and run marketing (You’d know zvents.com as Austin 360’s events calendar). Today, most event listings in Google are from sites on the Zvents’ platform; Paul led the adoption of their platform by over 400 local media properties, each indexed by Google. Leaving Zvents, Paul led marketing for Outright.com and there, developed a community platform to drive user generated content, social marketing, etc. on behalf of their accounting platform. Through both startups, Paul drove investments from Vantage Point Venture Partners, Sequoia Capital, First Round Capital, and Nokia. For much of the past year, Paul has been working as a fractional CMO for startups including FoxTranslate, IP Commerce, and Fliptop. See affiliatesummit.com/meetups for details on future Affiliate Summit Meetups. I recently got a neat sample from Deb Carney (Team Loxly Affiliate Management) from her client, Giftmoto, who make personalized gifts and themed party favors. Giftmoto doesn’t have any minimums and they do nice work with the customization, as you can see above with the Affiliate Summit East 2011 jar of jelly beans. The custom jars can be ordered empty, as well as with Jelly Belly Beans, M&Ms, or mints. These would be neat to customize and send as follow-ups with people you meet at conferences. Hmmm, I might do that after Affiliate Summit. Do People Remember Your Company? It’s essential to stand out with your audience, and I’ve seen a lot of creative ways that companies have done it over the years at Affiliate Summit. 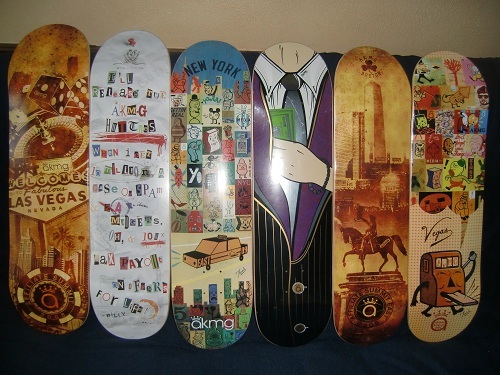 One of my favorites is from AKMG with their custom skate decks that they’ve given out at Affiliate Summit. Affiliate marketers clamor for the skate decks at the shows and I’ve seen some share pictures of the decks hanging in their offices. What a great way to stay top of minds with the people that matter to your company! Speaking of AKMG, Kimberlee White, President and Co-Founder of AKMG, will be on a panel at Affiliate Summit East 2011 called Do-Not-Track? Not-So-Fast. Here is the session description: In the name of privacy, proposed laws will diminish users’ Internet experience, and devastate online advertising all at once. Learn how to rally, educate and fight this misguided effort. We will be compiling a list of the parties taking place during Affiliate Summit East 2011 and posting the details on the Affiliate Summit blog. Submit your details if you’re hosting a party or other networking event during the conference. The Bullet-Proofing Your Affiliate Agreement presentation from Affiliate Summit East 2009, which took place August 9-11, 2009 in New York, NY. Avoid catastrophe and build in great offensive weapons and defensive shields by a carefully-crafted affiliate agreement. Bear in mind that most lawyers do not understand this specialized field.